Our winners will leave from the UK and head to Tenerife for their week long adventure. Upon arrival they will check into their room(s) at either our Palm Beach or Suites at Beverly Hills accommodation. After the winners settle in they can simply look forward to a week of riding their bikes in the October sun alongside postcard views. Our guides know the surrounding area like the back of their hands and will take you on some of the best routes on the island. Meals are on us - all you have to worry about is a glass of wine at the end of a long day. Aside from awesome bike routes the island is a hub of activity. Why not hit the beach, try some water sports, go rock climbing or just chill out by the pool. Sound like your kind of holiday? Like our Adrenalin Rehab Facebook page. Like our "Win a Bike Holiday" competition post. Comment on the post telling us why you want to win the holiday. Good luck to all who enter & hopefully we will be seeing you in October! 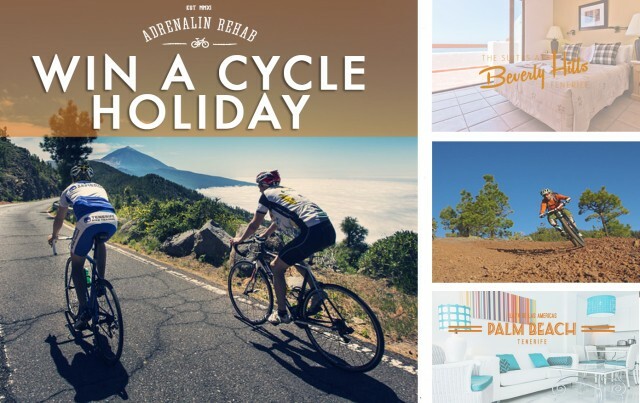 Find out more about Adrenalin Rehab holidays here!